Wow – can’t believe it’s been almost a week since I left the states. It seems like it’s been a lot longer, but that’s probably because we have been very busy since leaving Hanoi on Sunday morning. I could write a long narrative describing what we did each day, instead I’m going with a brief recap of each day, complete with maps to show where we’ve been. 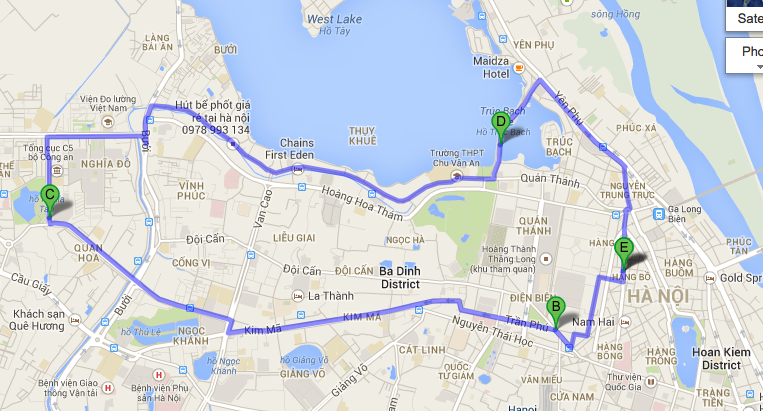 Visits to the Vietnam Military History Museum (B), Vietnam Museum of Ethnology (C), and a statue in honor of Sen. John McCain (D). Dinner with the group to go over the next few days and then an early night because of our 3 AM wake up calls the next morning. Early flight to Da Nang form Hanoi. 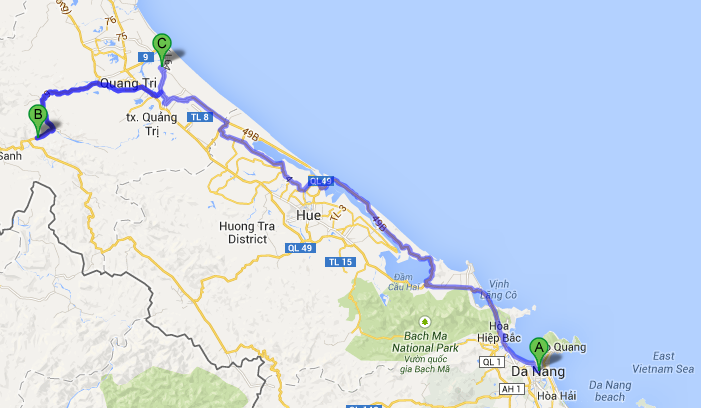 Drove from Da Nang to Dak Rong (B) to visit the library there. Left Dong Ha (A) for the long drive to Nam Dong (B) to visit the library there, meet with local People’s Committee officials and have an appreciation lunch at a very small local restaurant with the officials. Much beer was consumed by Chuck and I because they kept toasting us! We were off the beaten path on the drive to Nam Dong – Google Maps couldn’t even calculate a route since it didn’t recognize the roads we were traveling on. Overnight in Hue. I missed out on the pizza dinner this night because my body decided it needed to catch up on sleep. 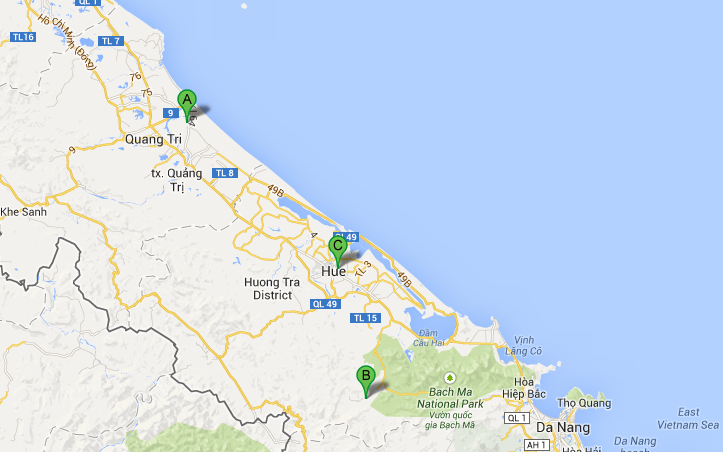 Left Hue and headed south back towards Da Nang. Stopped at Thanh Tam Seaside Resort in Lang Co Beach for a mid-morning coffee beachside. Unfortunately it was raining, but this didn’t stop Tierney and I from walking into the waves. FYI: Iced coffee in Vietnam is the greatest thing ever. Checked into the hotel, met up with some local people who CLI has worked with in the past. Lunch at Bread of Life Cafe. I totally ate a bacon cheeseburger, & fries, and regret nothing. Visited Village of Hope Orphanage. One girl in the deaf class took about 20 selfies on my phone and pretty much immediately found Angry Birds and began playing. Kids these days. . . 😉 She showed me around her classroom. Another boy is clearly a budding photographer – he loved using my big camera and was posing his classmates to take photos. 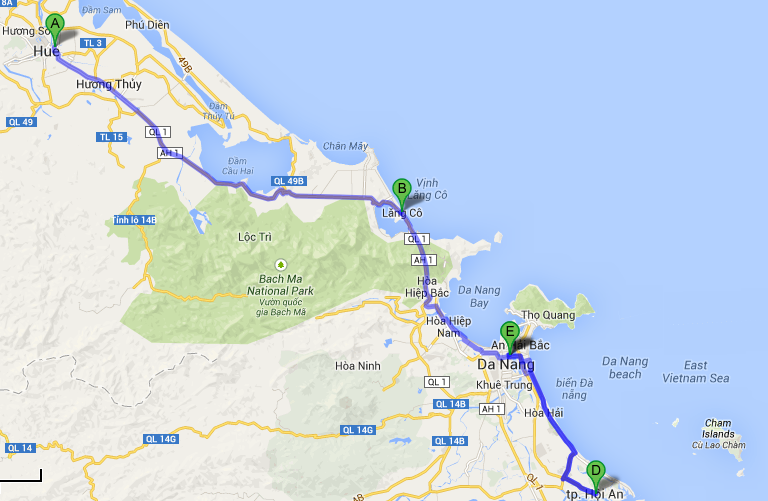 Headed down to the Old Town part Hoi An for a bit of shopping and dinner. Totally scored myself some custom made purple leather oxfords – photos to come. I would have gotten some custom made clothes if we had more time here. Definitely a place I need to visit again. It’s also a UNESCO World Heritage Site. 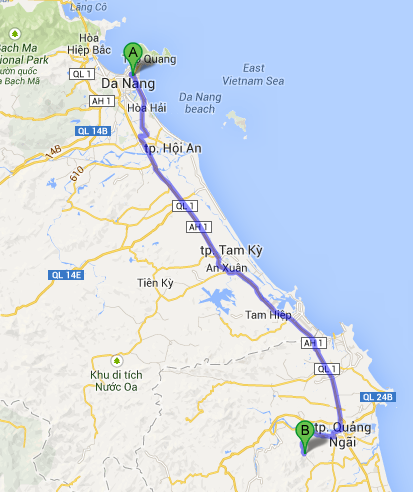 Fairly low-key day – drove from Da Nang (A) to Quang Ngai (B). Visited the Phu Hoa Orphanage. My mom brought along some sky lanterns, and we decided to try them out during this stop. The kids LOVED them. We left the remainder of them with head nun in charge (HNIC) so they could light them after dark and watch them fly. I wish we could go back do watch them and see the pure joy on their faces. My mom got the information from the HNIC and we are going to send more back in the future. Tierney also talked via one of younger nuns with three kids at the orphanage that were her age. One of the girls asked her if she used Facebook and wanted Tierney’s name so she could friend her. Can’t wait to see how that connection continues into the future. Rest of the evening is free since tomorrow is the big dedication at My Lai. The past few days have been absolutely amazing and I’m so thankful that I am able to have this experience. As an aside, I’m planning on writing some longer reflection pieces on our visits to the libraries and orphanages. I have a lot of thoughts related to those and I want to allow myself some time to reflect on the experiences. More to come on those topics and more recaps on our travels across this beautiful part of the world. Great job with this website. Three days and your dancing shoes will be on.